Merry Christmas everyone! I hope you've had/are having a wonderful day surrounded by loved ones and filled with lots of good food, drink and presents! 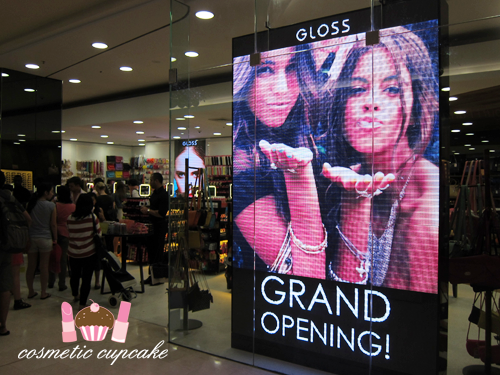 Gloss Cosmetics is one of those stores that every beauty loving girl dreams of and I'm no exception. They stock a number of Australian and international brands and I've frequented their stores for a number of years now. I'd always make excuses to go to Hurstville or Parramatta Westfield so the boy would drive me get my beauty fix! I've lost count of the number of times he's complained about waiting outside while I browse. 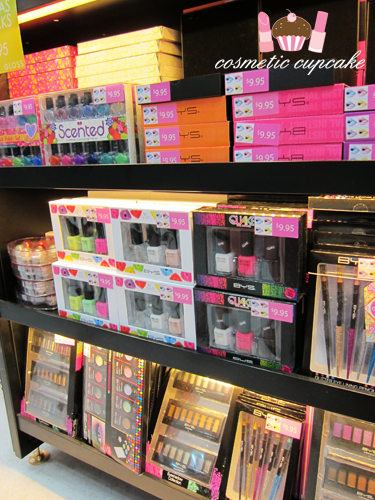 Of course the only thing I have eyes for whenever I go to Gloss is the nail polish! 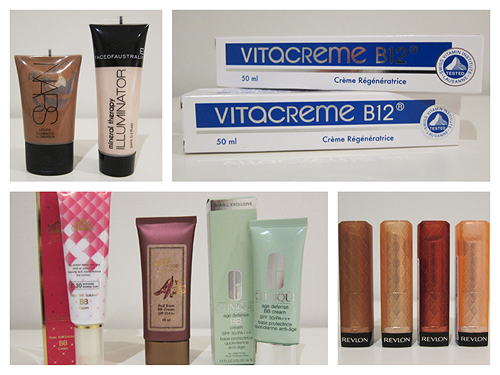 They stock one of my fave Aussie brands BYS and also brands such as Chi Chi, Revlon and Model Co. I was so excited to learn that they were opening their new flagship store in Parramatta and it's bigger than ever! It's nearly 4-5 times bigger than the original Parramatta shop which is still open if you're wondering. I was invited to check out the new store and I went along with Anita and Ange yesterday to join the opening festivities. To celebrate the launch of the new store, they treated everyone to fairy floss and flew up awesome nail artists I Scream Nails from Melbourne to do free manicures with a choice of 10 cute nail designs. That's me on the left getting my nails done and Anita on the right! 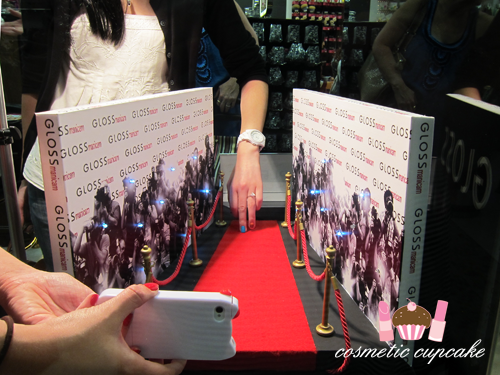 They had a special Gloss manicam set up where you could walk your fingers down a special miniature red carpet to show off your just done nail art. It was hilarious and SO cute! I would love one of these at home! You can check out the manicam in action here. Getting my nails did! I went with a tribal accent and a leopard accent and it was rather strange having my nails down for me and just sitting back and relaxing. 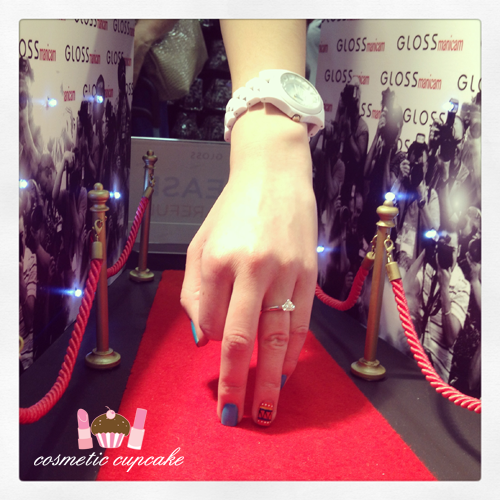 My nails on the red carpet! 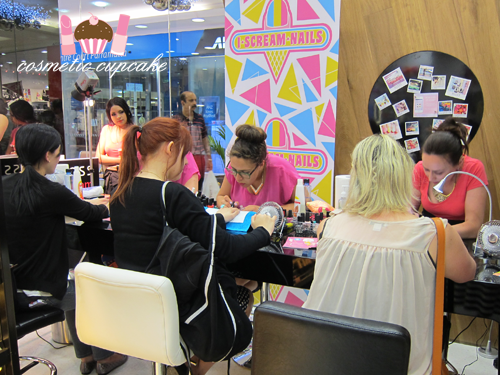 If you couldn't make it down to the opening you can still get your nail art fix at the Parramatta store. 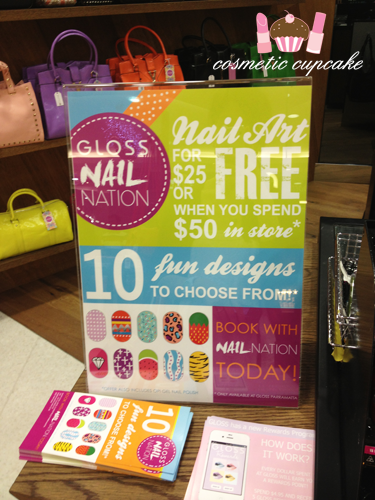 You can get a nail art mani for $25 or it's FREE if you spend $50 instore! Of course I couldn't resist buying SOMETHING (it's a bit hard to walk out of Gloss empty handed!) so I picked up some nail polish remover pads that smell soooooo delicious. Ange and Anita bought them in different flavours and I had to get one too. 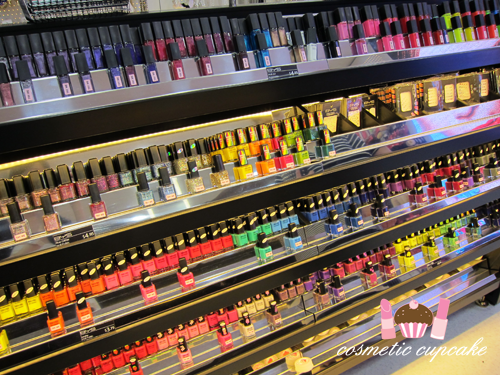 Have you been to Gloss Cosmetics stores before? Thank you Gloss for having me at the opening! In less than 5 months I’m getting married and my fiancé and I are very excited as you can imagine! The organising has been fun and relatively stress-free (except for the odd freak out by me) but there’s still lots to do. One of those things is deciding how to do my makeup of course! The photos and video that will be captured on the day is so important to me because that’s what I’ll have to remember the day by so I want my skin to be glowing and in the best condition on my big day. 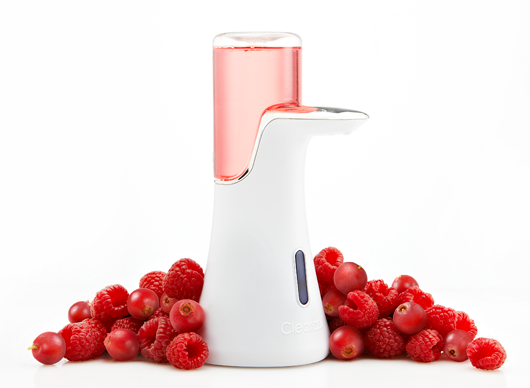 This is very achievable since I’ve been using the automated dispensing delivery system of the Clearasil PerfectaWash for the last few months! If I’m feeling confident with my skin I know that will show through in the photos and give me so much more confidence on the day. There’s nothing worse than having cameras follow you around if you’re self conscious. I want a really natural look but I want to play up my eyes with a slightly darker neutral smokey eye. 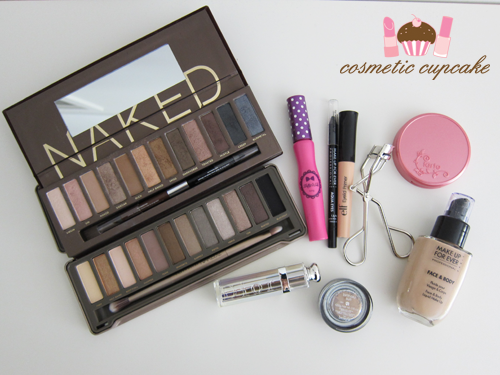 I love a neutral eye and it’s what I feel most comfortable. I won’t be doing my own makeup on the day but that hasn’t stopped me from trying different looks myself! For this look I used a light base of Make Up For Ever Face and Body foundation in 20 and used a light dusting of powder. For the eyes I lined my eyes using Make Up For Ever Aqua eyes in black and used Urban Decay Sin and Busted from the Naked Palettes to create a smokey eye. I curled my lashes and applied 2 coats of Dolly Wink mascara. For the rest of the face I kept it natural by using Tarte Amazonian Clay Blush in dollface and Dior Addict lipstick in Model. 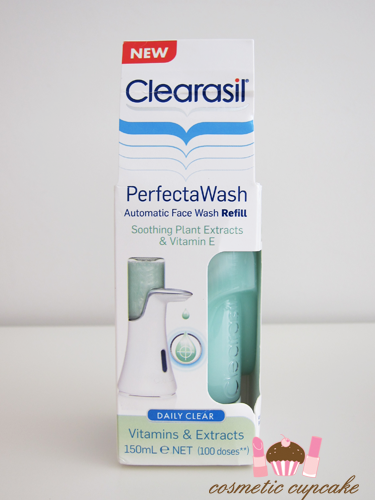 Have you tried the new Clearasil PerfectaWash, what were your thoughts? Leave me a comment with your answer below for your chance to win! Easy! 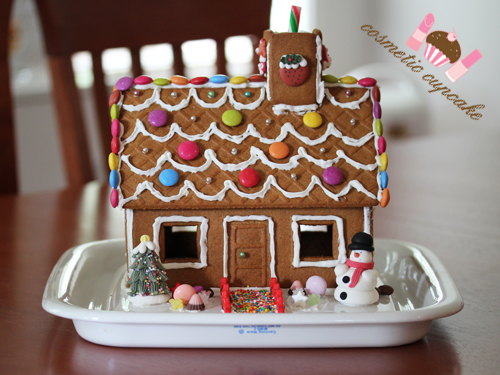 The competition is open to Australian residents only and ends at 5pm AEST on December 18th 2012. The winner will be chosen by Nuffnang. See Terms & Conditions here. Hi ladies! My loooooong overdue blog sale is now up! It's not everything I need to get rid of but I'm a hoarder (seriously I need to go on the show!) so it takes me a while to part with stuff haha. I have some makeup and skincare to sell as well as of course nail polish. 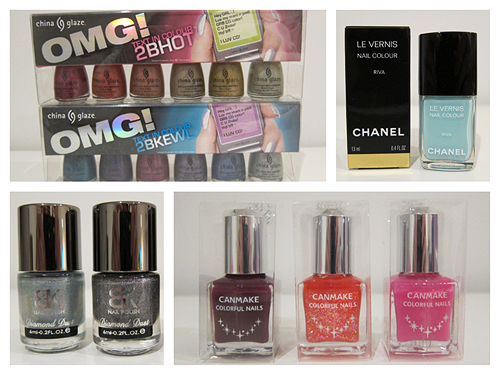 I have a few HTF (hard to find) ones including a brand new in box China Glaze OMG collection. For some reason whenever I want to do a glitter gradient mani I always reach for the Jill Stuart Bare Petal Spring collection polishes I hauled in HK earlier this year. The colours are so pretty and perfect for the warmer months! They're perfect for any time you feel like a girlie colour really haha. 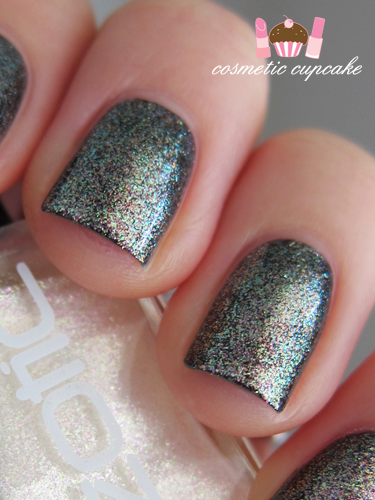 Also because they're on the sheer side they show some VNL so glitter tips are perfect. I used 3 coats of 55 Floret Bud which is a sweet pink with shimmer and applied China Glaze Medallion to 2/3 of my nails, then went back over the top 1/3 and dabbed some Milani Jewel FX Gold here and there too. 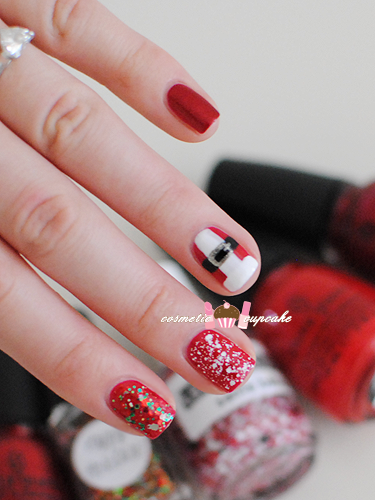 So easy to do but always looks fantastic! You might have noticed that I've changed the positioning of my watermarks. I am SICK AND TIRED of people on Instagram/weheartit/all over the internet etc cropping watermarks and claiming blogger's manicures as their own. I hate having to make it so prominent but I'm just over it. OVER IT!!! These people should spend less time making "inspiration" accounts and practising nail art themselves. 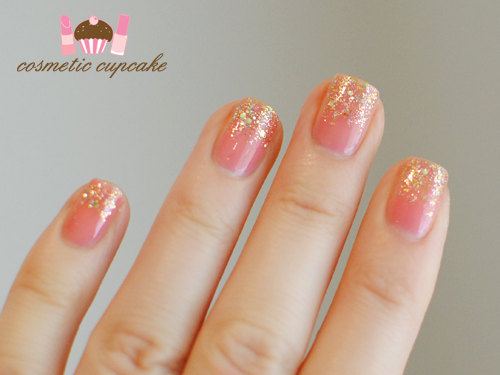 anwyay, glitter gradient manicures satisfy some of my need for nail art but I still need to get back into proper nail art! 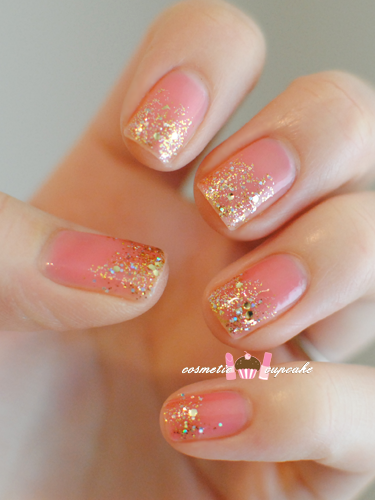 What do you think of glitter gradients? Thanks for looking as always! The lovely Susan from The Subtle Shimmer opened up her online store Star Trinkets earlier this year selling 2 things I absolutely love - nail polish and jewellery! 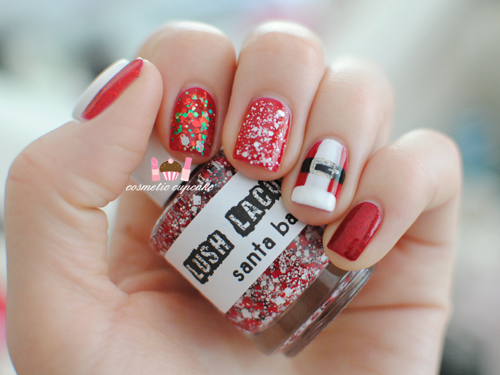 She stocks a number of polish brands such as PicturePolish, China Glaze, Pomegranate Nail Lacquer and Ozotic Pro. She kindly offered to send me some Pomegranate Nail Lacquers to review and I asked her to surprise me with the shades. She sent two gorgeous shades my way and I have Cardigan for you today which is a beautiful jelly. I ADORE jelly polishes like crazy! 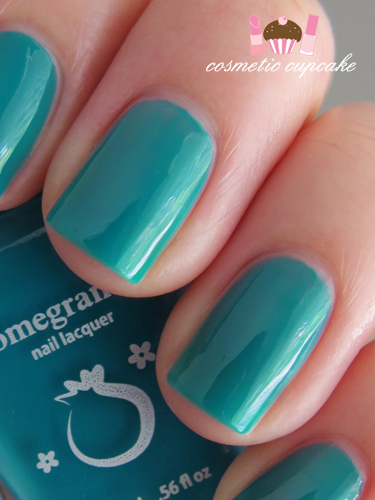 Cardigan is a gorgeous rich teal jelly. It's one of those teals that my camera absolutely hates unfortunately so I've tweaked the colour to show the colour as accurately as I can. It's such a beautiful shade! 3 coats is needed for opacity which is pictured here and it dried quickly to high gloss finish. It's not as squishy as other jelly polishes but just squishy enough. I'm dying to do jelly sandwiches with it! Details: Pomegranate Nail Lacquers are available from Star Trinkets for $11SGD and from the Pomegranate online store for $9USD. Thank you Susan for sending me this beauty to try! 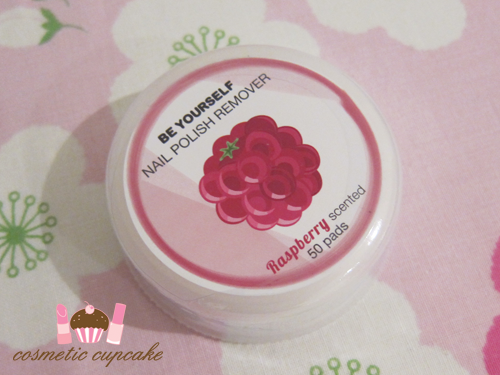 Have you tried Pomegranate Nail Lacquers before? 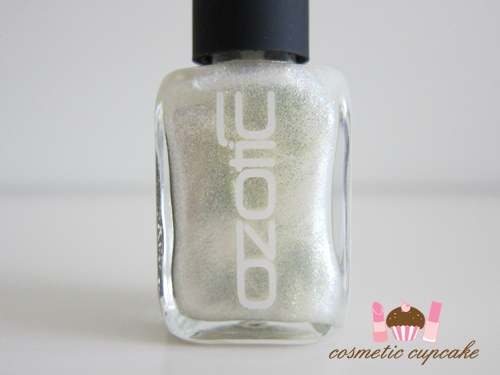 I have another pretty shade to show you shortly!